On DD Freedish platform 60 TV channels going to be add by July 1st, 2014. Channels would be in encrypted and mpeg-4 format. DD Direct Plus doesn't have a brand name anyone remembers before, neither a call centre nor an electronic programming guide and no fancy marketing campaign. Yet in its 10th year, DD Direct Plus, recently renamed DD's Freedish, has become India's largest direct-to-home, or DTH, service. At an estimated 18 million homes, it is bigger than Zee's Dish TV or Tata Sky. DD Freedish reaching all over India via satellite link. The Rs 1,553-crore state-controlled Prasar Bharati Corporation, which owns the service, has now woken up to its potential. "We will launch 120 channels (an addition of 60 channels) from July 1, 2014, encrypt them and move to the MPEG4 format," says Ranjan Thakur, additional director general, Doordarshan, and the man running DD's Freedish. These changes will mean more capacity and the ability to track its subscribers, something that was not possible so far because the signal was unencrypted. The tracking will help push up the prices channels have to pay to be on board. At around Rs 134 crore in March 2014, DD's Freedish is the smallest entity by value, but has the best margins in the business. Every other DTH player makes a loss (see box). In the next two years, as the service shifts satellites, Thakur reckons DD's Freedish will offer over 250 channels. 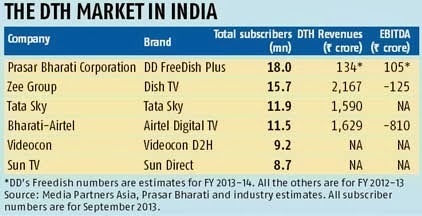 DD's Freedish could end up becoming the biggest game-changer in the Rs 40,000-crore Indian television industry. That's because it is the largest and only player in the free-to-air, or FTA, market focused largely on small-town and rural India. "The DD's Freedish household's value is very high because it is equal to a terrestrial household, which is the target for FMCGs, white goods, insurance and other major advertisers. So far the only option to reach these homes was DD, now there are FTA options," says Bharat Ranga, chief content and creative officer, Zee Enterprises. Adds Gaurav Gandhi, COO, Indiacast, Viacom18's distribution arm: "DD's Freedish is very relevant beyond the top 40 towns." And affirms Prasanth Kumar, managing partner, South Asia, central trading group, GroupM, a media buying firm: "If an advertiser is looking at Tier II and III markets, then FTAs are critical." In 2013, FTAs got 4-9 per cent of the total viewership of television and more than 20 per cent of the Rs 18,000-crore ad money spent on the medium. And this figure has been growing in double digits year-on-year. This explains why more than 30 channels, such as Zee Anmol and Star Utsav, pay between Rs 3.25 crore and Rs 6 crore a year to be on DD's Freedish. "The cost is well worth it," says Ranga.